Total: 2 hr. 10 min. Skip the sugar, price, and preservatives in dried fruit from the store. Dried fruit is easy to make on your own. Spray a cookie sheet with cooking oil, set aside. Wash and dry apples. Using a mandolin, slice apples into thin strips. 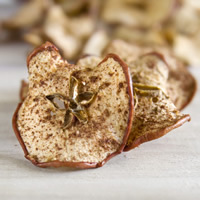 Place apple slices on cookie sheet and sprinkle with cinnamon and sugar. Bake in the oven for one hour. Flip apple slices and bake for an additional 40 to 60 minutes. Ovens vary, so if they appear too soft, continue to bake until they are somewhat crisp.